How to Measure: Please measure your dog from lower mid neck to root of tail. Dog has to be standing straight with head up. Place tape measure between shoulder blades and start to measure where collar bottom sits if it were worn mid neck. neck. Order the corresponding back length listed below. These coats should overhang the tail by at least 2" if not more. You do not need to add this to the back length when you measure. Examples of back sizes for Kitsch Coats. I also have extra large 33" coats but these are for VERY large males only. If your grey is coming up small, please measure the chest circumference. If larger than back length, best to go up a size. All my coats fit lovely Lurchers regardless of mix, hair length or deep chest. Just follow measuring guidelines above. As a very tough guide smaller lurchers (X whippets) are around a 23". Medium sized (X collie) would be a 25". Kitsch coats are measured differently to other coat manufacturers so please measure actual dog for happy results. I am happy to advise if you are unsure. I will exchange on coats but they have to be in the same condition they were sent out in. All hairs must be removed! 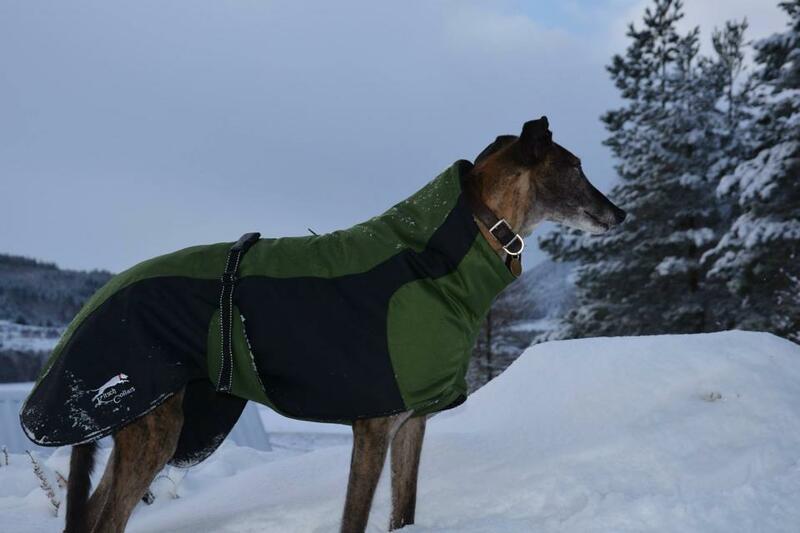 Please note, Kitsch Coats are designed for Sighthounds only.